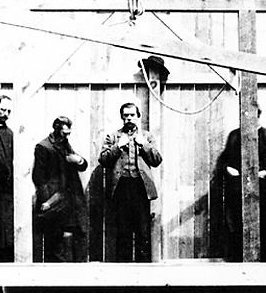 On this date in 1887, William Jackson Marion was executed in Nebraska for the murder of his best friend, John Cameron. 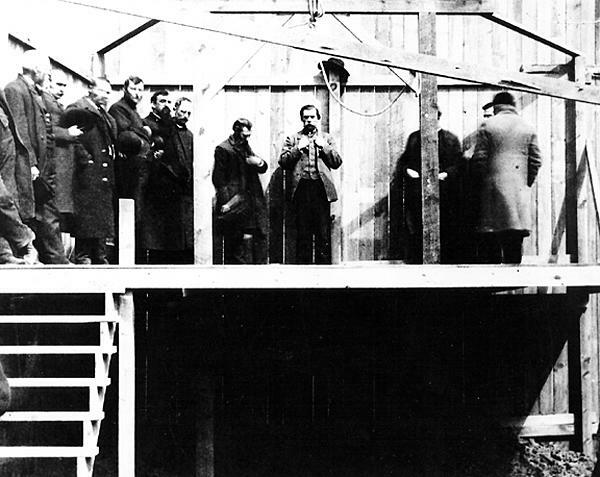 And then, as given by the Gage County Democrat, the first, last, and only man hanged in Beatrice “stood erect upon the trap-door while his hands and feet were bound, the black cap drawn over his face, and the noose adjusted,” the trap sprung, and after a thousand-plus people had taken the opportunity to view this infamous corpse, it was buried in the potter’s field. It was then 15 years since young “Jack” Marion and John Cameron had hauled out from Grasshopper Falls, Kansas, looking for work on a railroad. Somewhere in the wilderness, John Cameron disappeared, and Marion returned to his mother-in-law’s saying his buddy had left. Marion’s whereabouts fade; he’s supposed to have drifted in Indian country: was it flight? It sure looked that way a year later, when a body turned up with clothes that matched Cameron’s … and bullet wounds in the head. Only a decade after those railroad recruits had rolled out their mule-packs was Marion finally apprehended and tried, and even then, it would take four years (and two trials, and several appeals) to resolve this circumstantial and very cold case. The matter was indeterminate; the newspapers in town sniped at each other over the proper course — “there is a strong under current of public sentiment that is opposed to hanging, and particularly upon circumstantial evidence, collected ten years after the trial [sic], and connected by the testimony of his mother-in-law who showed … personal malice” complained the Gage County Democrat. Up to the very last, the governor postponed hanging by two weeks in response to a citizens’ petition. As is so often the case, though, the will to grant outright executive clemency went begging. In 1891, under the headline The Dead Is Alive!, the Beatrice Daily Express delivered a thunderbolt to its readers. There has always lingered, and always will linger, in the minds of a number of people … a doubt of Jack Marion’s guilt of the murder of John Cameron, and for which crime he was executed in this city four years ago. The Express has today received almost indisputable information which establishes the startling fact of Jack Marion’s innocence. 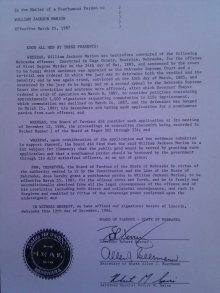 In other words John Cameron is still alive and was seen at LaCrosse, Kansas, one week ago Saturday, and a statement was obtained of him regarding his whereabouts from the time he and Jack Marion separated … and upon which day the law says Jack Marion killed his boon companion and friend. The “victim” hadn’t been killed at all — he’s just up and blown town, just like Jack Marion said. Although John Cameron turned up alive four years after the hanging, it would take another ninety-five for John Law to set things right. Now that’s bureaucracy for you. 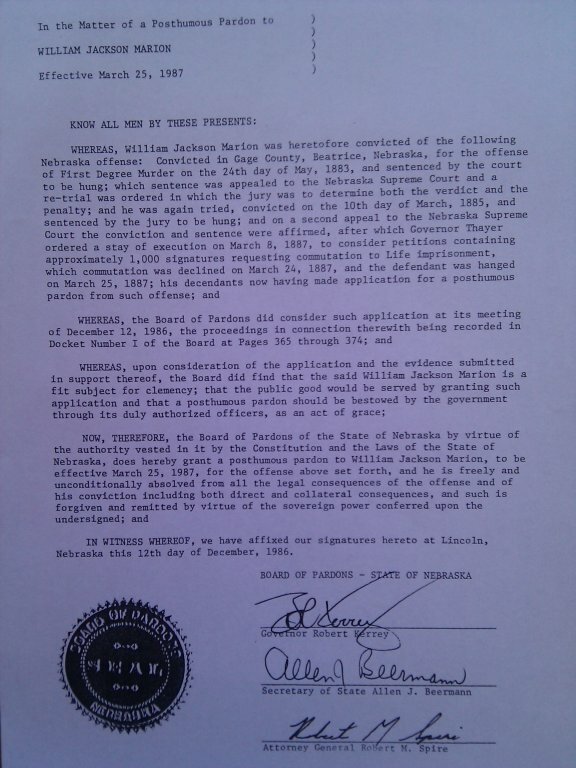 Nebraska’s In the Matter of a Posthumous Pardon to William Jackson Marion, under the signature of Gov. Bob Kerrey, took formal effect on the 100th anniversary of its title character’s death — March 25, 1987. * Elbert Marion’s hypothesis — and it is only that — was that Cameron, fleeing a potential paternity suit, swapped outfits with an Indian who might also have been on the run from his own trouble. Elbert reckons that the trick might have worked a little too well, and Cameron’s pursuers ambushed the Indian by mistake. 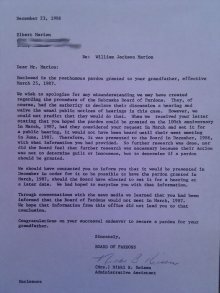 ** One of Elbert Marion’s letters to the Pardons Board contains an offhanded reference to Kansas’s 1907 abolition of the death penalty; Elbert Marion believed (or had heard) that his grandfather’s execution had helped influence the legislature’s decision, but I have not been able to further substantiate this notion. 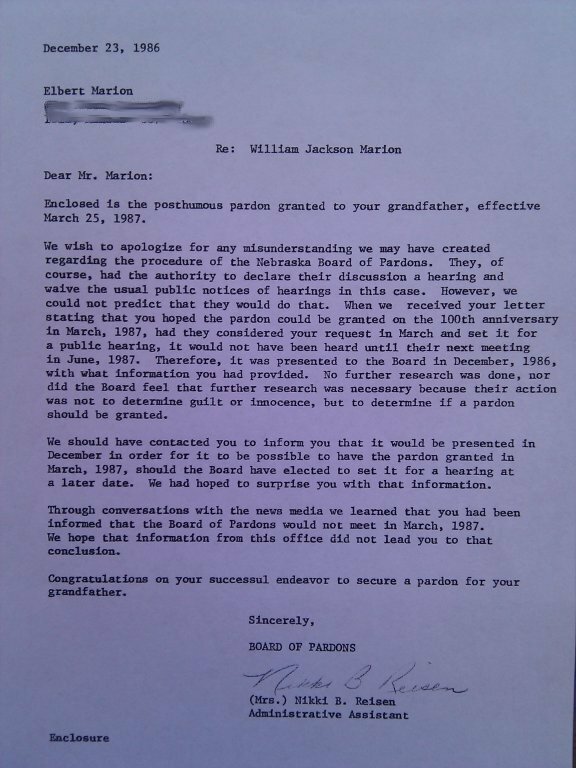 With special thanks to Sonya Fauver at the Nebraska Pardons Board and Allen Beermann, Nebraska’s Secretary of State at the time (and one of the signatories on the posthumous pardon) for archival assistance on this story.